FOR MORE INFORMATION VISIT: http://zeitgeist-art.com/mixtape "Please join us for the opening of MixTape, Vesna Pavlović’s third solo show with Zeitgeist. MixTape explores Pavlović’s personal documentary photography archives taken in Serbia during the 1990s, and offers a comprehensive look into an ‘aesthetic of resistance’ at the time of the dissolution of Yugoslavia. Her images capture the 1996 student protests, her early engagement with the art collective Škart and their radio and street performances, the work of peace pacifist group Women in Black, and various other non-for profit organizations such as Radio B 92 and Center for Cultural Decontamination. The images convey an intimate view into a public sphere seen through the lens of a generation which defined a ‘geography of counter-public’ in Serbia and Montenegro during a decade of hardship. During a period of crisis, wars, hyper-inflation, and mass emigration, creating photographs was an act of citizenship and resistance. Different genres of documentary photography on display present a recollection of ‘networked’ memories of individual and collective moments of protest, in which music plays an integral part. As one of the early photographers of the music magazine Ritam in Belgrade, Pavlović created an archive of concert photographs which could be seen as a counter archive to her more institutional documentary work. 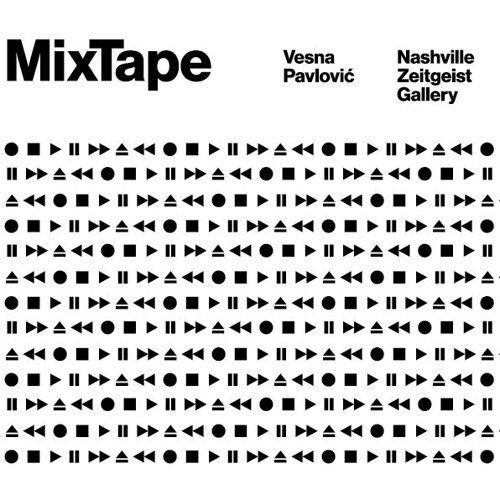 For her show, the artist selected a number of songs by bands of the former Yugoslavia, which were transcribed phonetically and offered to a group of Nashville musicians to create a special mixtape. MixTape tape will release on Saturday, October 13 with a music performance in the gallery."